I receive free products to review and participate in affiliate programs, where we are compensated for items purchased through links from our site (at no cost to the buyer). Do you want to prevent nasty bed bugs and all of the pain that they cause? Prevention is a lot easier than getting rid of bed bugs once they have moved in. Recent studies suggest that bed bugs are the most difficult pest to treat – way more difficult than termites, mice, cockroaches and ants! Follow our advice and you will stay bed bug-free. One of the best methods for preventing bed bugs is to make sure you don’t inadvertently bring them home with you. If you went on a vacation and your hotel room may have had bed bugs, then you should unpack your suitcase outside your home. Make sure you immediately put your clothes through a hot wash and dry cycle. Put no-pest strips and your suitcase in a garbage bag for a few weeks to disinfect it. Because pets are another big carrier of bed bugs, you should regularly inspect the area where your pet sleeps for signs of bugs. If you think bugs are in your mattress, then use special covers designed to trap bed bugs on your mattress and box spring. These covers make it impossible for the bugs to come out while you are sleeping. Make sure you leave the encasements on for at least a year. Be sure the cover has been tested and is certified for bed bugs, or else it may not be strong enough to last the year without ripping. You should try not to bring used furniture, especially mattresses, into your home without carefully examining them for any sign of bed bugs. Another way to proactively avoid a bed bug infestation is to clean your home regularly. A home that is cluttered gives places for bed bugs to hide and reproduce. Make sure you regularly wash and heat-dry your sheets, bedspreads, blankets, and any clothes that may touch the floor. This will create a bad environment for bed bugs, and will also kill any existing bugs or eggs. Laundry baskets are the perfect breeding ground for bed bugs, so make sure you carefully clean your laundry containers every time you do your laundry. If you think bed bugs are in your home, then there are a few ways to verify if they are actually there. First, check for signs of their feces. They are usually small, black or dark brown dots on your sheets or mattress. While bed bugs try to hide during the day, you may be able to see the actual bugs at night. Using a flashlight, carefully comb over your mattress and sheets. Unfortunately, baby bed bugs are almost invisible, but you may be able to spot the older ones – they are oval-shaped and have a red-brown color. If you find bed bugs in your house, then you should consider seeking professional help. 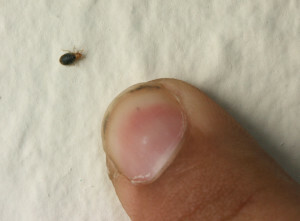 Bed bugs are elusive, so it is pretty hard to address an infestation by yourself without the right tools. Pest control services can be quick and affordable, ridding your house of the bed bug problem for good. It’s best to try to avoid this situation entirely by preventing bed bugs from ever entering your home in the first place. If you can work to avoid bed bugs ever entering your home, you won’t have to go through the painful and tedious process of getting rid of them. Preventing is the key, so do what you can to avoid bed bugs in the first place.